The Berry Cheesy Strawberry Cheesecake That Will Melt Your Heart! I made my first cheesecake when I was already out of college. I just got tired of spending too much money on take-out desserts, which I could actually just make at home. My first attempt was a no-bake Oreo strawberry cheesecake. I went straight to the supermarket, guessed the basic ingredients, and went home to experiment. I first crushed some Oreos, mixed them with melted butter, and placed them on a pan. I mixed together the cream cheese, sugar, and gelatin; and poured the mixture on top of the frozen crushed Oreos. I remember pouring the whole jar of Strawberry Smuckers on top and spreading it like a madwoman desperate for dessert. Surprisingly, despite the lack of necessary ingredients, it turned out well. But this strawberry cheesecake recipe that I found tastes a hundred times better than that experimental cheesecake. Photo courtesy of Serious Eats. Recipe courtesy Arlene Cummings via Betty Crocker. 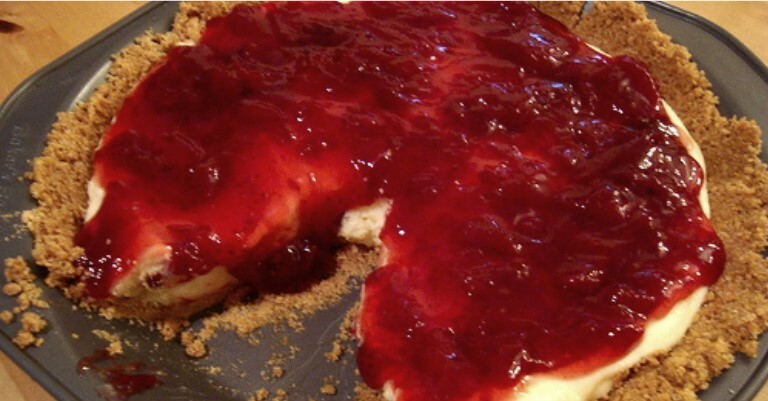 Quick Tip: Slice the cheesecake using a hot wet knife, and wiping the blade in between slices. These Are The Sweetest Blueberry Muffins—And It’s Not A Joke! This Homemade Vanilla Ice Cream Is As Easy as 1-2-3!